Clean And Simple 255 | Stampers With Altitude!!! Every week, I stop what I am doing (this week started craft fair crafting) and try something different. Usually, I go to cleanandsimplestamping.blogspot.com because that’s my style. I love clean, simple cards. I can get fancy… but usually it’s inspired by someone special or a card someone else created. I live here, in the clean and simple section. I see the layout and get to work. I usually know exactly what I am going to do when I see the layout. So, instead of my normal neutrals color scheme (although l have been using this color scheme a lot lately) – I decided to use the Afternoon Picnic color scheme. Very Vanilla, Wisteria Wonder, Coastal Cabana, and Basic Gray (there’s a couple more I just didn’t use them). 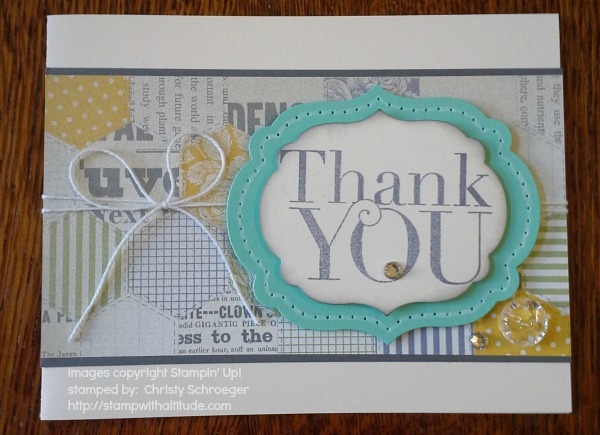 Anyway, here’s my card – I wanted to use the new photopolymer stamp set – Another Thank You! I LOVE IT!! I’m going to use it again soon too!! The really big thank you would make another amazingly clean and simple card! Oooo… got an idea! Ok… You will see this later on this week! Great card! Love the DSP and that Thank you stamp! Can’t wait to get my hands on that set too! Sweet card! I love your background paper and soft color.